In collaboration with ScholarSpace at University of Hawaii at Manoa (see http://scholarspace.manoa.hawaii.edu ) CTAHR OCS is digitizing selected publications produced before Web posting of our publications in digital format became standard practice (ca 1997). Faculty who wish to nominate out-of-print, pre-digital CTAHR publications for priority attention should send lists of titles by e-mail to evans@hawaii.edu. Hoon Park, Mike DuPonte, BIO-9, 6 p.
Ted Radovich, Ken Love, EI-15, 7 p.
Peter Hsu, Diane Masuo, Grace Fong, John Yanagida, ET-8, 6 p.
Jim Brewbaker, HGV-4, 3 p.
Mark Thorne, Linda Cox (editors), SFFD08.pdf, 43 p.
Scot Nelson, Kelvin Sewake, PD-47, 10 p.
11 SEPTEMBER 2008 APIA (Pacnews) ----- The Second Regional Conference of Ministers of Agriculture and Forestry Services was held in Apia, Samoa on 8-9 September 2008 on the theme of ‘Food security, nutritional balance and sustainable management of natural resources’. Participants attended from the member countries and territories of the Pacific Community, development partners, regional and international organisations and public and private sector bodies. The meeting was chaired by Samoa. Ministers welcome the outline of key challenges expressed in the opening address by Samoa’s Prime Minister, Hon. Tuilaepa Sailele Malielegaoi, and commend his continuing promotion of the contribution by the agriculture and forestry sectors to social and economic development. The Ministers reaffirm that they will continue to provide leadership in working with their communities and development partners to address food security. They will seek a higher priority in national budgets and regional programmes towards developing agriculture and forestry. The generous support of development partners and key regional and international institutions is gratefully acknowledged, and the Ministers look forward to a continuing collaboration for the benefit of Pacific communities. Long-term success will rely on the ability of member countries and territories to access the financial and human capacity necessary to respond to changing needs. In this regard, the Ministers endorse the LRD Strategic Plan 2009-2012 that will guide the delivery of services by the Secretariat of the Pacific Community and other partners, and acknowledge the importance of integration between the different sectors within Pacific island countries and territories. Ministers recognise the potential benefits of greater involvement of Pacific youth and women in the agriculture sector, and endorse the development and implementation of a Pacific Youth Strategy to support this engagement. Ministers welcome the decision of the Forum Leaders to prioritise action on food security in the Pacific Plan, and fully support the SPC paper that identifies measures to help improve food and nutritional security. The Ministers recognize the contribution that trade makes to food security. The increasing fuel and food prices results in differing impacts on food security because of the diversity within the region. For some of the larger countries, this presents opportunities, yet for others, such as the countries with limited land and reliance on imported foods, significant challenges exist. Support from SPC and other agencies must reflect this, with a wide range of responses, from targeted investment and strengthened public-private sector partnerships. 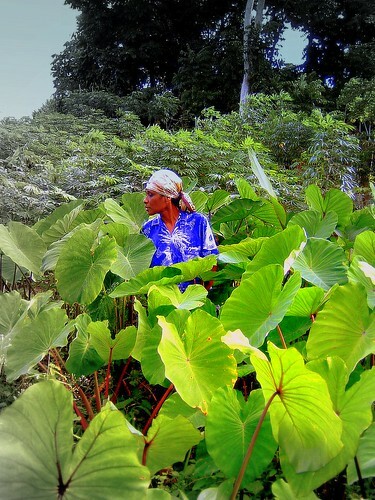 The importance of agro-biodiversity, traditional crops and production systems must also be acknowledged especially in the small Pacific Island Countries and Territories and in the rural areas. Customary food security mechanisms should be acknowledged for their important contribution to food security. Ministers endorse the Niue Declaration on Climate Change by Forum Leaders and endorse the strengthened focus on climate-change-related activities within LRD as reflected in the LRD Strategic Plan 2009–2012. Ministers endorse the strengthened partnership and cooperation between SPC and other relevant international and regional agencies in increasing the capacity of PICTs to achieve the goals outlined in the Pacific Islands Framework for Action on Climate Change. The reliance on marine resources for food security and income generation, and the impact that climate change will have on this valuable resource, was highlighted. It was proposed that SPC and partners work to integrate all the sectors, such as the joint paper being presented at Committee of Representatives of Governments and Administrations of the Pacific Community (CRGA), which will include agriculture, marine and social issues, affected by climate change. Ministers voiced their concern as to how climate change is seriously impacting the region, especially on the smaller countries. This concern should be voiced strongly at international fora, and donors should acknowledge that in order to respond to climate change, funding assistance to SPC and other regional agencies needs to be increased. Ministers commended the launch by the Prime Minister of Samoa of the Pacific Regional Organic Standards at their meeting. It is the third organic standard in the world, following similar initiatives in EU and East Africa. The standard was formally adopted at the recent Pacific Forum Leaders meeting in Niue. Ministers agreed that the Pacific should be proud of this development and use it to launch Pacific products in the international market. The meeting welcomed the statements by Ministers and heads of delegation, which are summarised in Annex 2 and the four key note presentations from SPC and partner organisations. The Ministers adopted the Recommendations of their meeting, as well as those proposed by the Heads of Agriculture and Forestry Services attached as Annex 1. The Minister welcomed the invitations by Tonga to host the HOAFS meeting in 2010, and by Papua New Guinea to host the next HOAFS and MOAFS meetings in 2012. With Hawai'i's elderly population expanding quickly, hiring a geriatric specialist seemed a good idea to officials at the Wai'anae Coast Comprehensive Health Center. But when they examined the center's demographics, they found a smaller-than-expected number of patients over age 65. The stark truth was that many patients from the largely Native Hawaiian community were dying off before reaching old age, succumbing after years of struggling with diabetes and its complications, which include stroke, heart disease and kidney failure. "Patients age 45 to 65 were getting everything 20 years earlier. That's why we didn't have a lot of elderly patients," said medical director Dr. Rick Custodio. In fact, Native Hawaiians are more than seven times as likely to die from diabetes than whites in Hawai'i, according to the state Department of Health. They also have the highest diabetes rate in the state and are diagnosed with the disease at an earlier average age than other ethnic groups. "It's devastating for the Hawaiian community because so much of the population is affected," said Mele Look, director of community engagement in the University of Hawai'i medical school's Department of Native Hawaiian Health. "What's most alarming is how much it's appearing in children, and that hits any society hard, particularly the Hawaiian community. It's very hard now that they're seeing a very serious, disabling disease in their children." Asians and other Pacific Islanders also suffer disproportionately from diabetes, a condition marked by high levels of blood glucose resulting from defects in insulin production or use. Researchers are uncovering clues as to why minority groups are more prone to type 2 diabetes, the most common form of the disease, but Look said hereditary conditions are overshadowed by controllable risk factors such as diet, physical activity levels and other behavioral choices. Nearly 12 percent of Native Hawaiian adults in Hawai'i have been diagnosed with diabetes, compared with 9 percent of Japanese, 8 percent of Filipinos and 5 percent of whites, according to the Health Department's 2007 Behavioral Risk Factors Surveillance System survey. Native Hawaiians also have the highest diabetes mortality rate of any ethnic group in the state: 47 deaths per 100,000 population. That compares with seven for whites, 19 for Japanese, 22 for Filipinos and 32 for "others," including Chinese. The average age of diagnosis for Native Hawaiians is 43, five years younger than the nearest ethnic group, according to the survey. Kane'ohe kumu hula Wayne Panoke was only 25 when he was diagnosed with type 2 diabetes. Instead of taking steps to improve his health through lifestyle changes, Panoke depended on medication to control his diabetes. Then, seven years ago he fell ill and was told he would have to immediately start dialysis or die. At the time he weighed 485 pounds. "I just lost my father and I realized I needed to live to fulfill my promise to him to take care of my mother and the three children they had adopted," said Panoke, 60, who began watching his diet and increased his activity levels. Today he weighs 276 pounds and is no longer on diabetes medication, although he still requires dialysis three times a week because of the irreversible damage done to his kidneys by diabetes. Through his own struggle, Panoke has become more aware of the toll the disease has taken on his fellow Native Hawaiians, and he has become active in native health issues. "With diabetes, Hawaiians are dying by the minute," he said. "I'm saddened by it each day. When I go to dialysis each week I see more and more of my people sitting on those chairs, and what troubles me most is that they are getting younger. When you see 21- and 22-year-olds sitting in those chairs, it gets very hurtful." He said the impact of Western lifestyles, the disconnect between many Native Hawaiians and their culture, and economic stresses are major contributors to many health problems in his community. "The 'ohana structure is collapsing because of economic needs. There's not enough income to eat properly and people live off canned goods two or three nights a week, and that's not good from a health perspective." Nearly three-quarters of Native Hawaiians are overweight or obese, compared with approximately half of whites, Filipinos and Japanese, according to Health Department surveys. More alarming is that 43 percent of Native Hawaiians are obese, compared with 22 percent of the overall adult population. Lower levels of education and household income are two risk factors for obesity, and statistics reveal that Native Hawaiians are at the bottom in both categories. Native Hawaiians also rank low in daily vegetable and fruit consumption and in leisure-time physical activity. "People with lower income have a tendency to eat cheap fast food that's very high in fat. In many communities, especially in the urban core of Honolulu where there are a lot of immigrants, they don't have as much access to fresh fruit and vegetables, or parks where they feel comfortable walking," Look said. Dr. Wilfred Fujimoto, a diabetes expert and retired endocrinologist, said Hawaiians and Asians have undergone a dramatic shift away from traditional diets and activities that helped protect them from chronic conditions such as diabetes, hypertension and heart disease. "Pictures from the old days show Hawaiians were all pretty lean and muscular, and now there is an increasing occurrence of being overweight and obese. The lifestyle of the Pacific people has changed. They don't have to fish or farm. Walking long distances is not part of their usual lifestyle anymore," Fujimoto said. "It's the same story for Asians who came to Hawai'i as plantation laborers. We've seen a rise in diabetes as they have become more sedentary." A study by University of Hawai'i researchers found a reduced prevalence of diabetes among Japanese men who had retained a more traditional lifestyle that included regular physical activity and a diet of rice, vegetables and small amounts of fat and animal protein. For more recent arrivals, diabetes can be a byproduct of their reach for the American Dream, as they adopt Western habits and struggle to assimilate. Look said it's not uncommon for immigrants who come to Hawai'i in good health to develop diabetes or pre-diabetes within 10 years. The waiting room at the Kalihi-Palama Health Center fills every Wednesday morning with low-income patients seeking services at a diabetes clinic started nine years ago to serve mostly Filipino and Micronesian immigrants. Its staff of two nurse practitioners, a nutritionist and a diabetes educator see 20 to 30 patients during each weekly session, checking their blood glucose levels, charting their progress and advising them on as diet and exercise. "Food is a big issue for a lot of our patients," said certified diabetes educator Jane Pelkey. "For many of them, rice is their main staple and that's dangerous for a diabetic." A lot of patients are unemployed and often turn to food to deal with the stress in their lives, she said. Nurse practitioner Anne Leake, who also works at the diabetes clinic, said a 10-pound weight gain during an immigrant's first year after arrival is not unusual. "They're eating a more American diet and eating more calories, but it's not just because of increased calories. They also are less physically active," Leake said. "Most, especially those who lived in the provinces, were used to walking long distances. "And now they have some money and they are less poor, and food is cheaper here as a percentage of their income and it's more available. When you come from a country where food is so limited and then you come here and it's unlimited, naturally you're going to take advantage." Immigrants from the Micronesian islands offer additional challenges, Leake said, such as their unfamiliarity with refrigeration and other conveniences that would allow them to enjoy more fresh foods rather than rely on canned goods for nutrition. Also foreign is the Western concept of "working out," or "sweating for the sake of sweating," Leake said. Many Pacific languages don't even have a word for "exercise," said Puni Freitas of Kokua Kalihi Valley, a nonprofit health organization. She recalls that when Kokua staff tried to encourage some Micronesian patients to incorporate walking into their daily routine, the puzzled response was: "Why would we walk when we can catch the bus?" To provide the kind of useful physical activity that makes sense to Pacific Islanders, Kokua Kalihi Valley and other health programs have started community gardens where they can "work out" and harvest fresh produce to enhance their diets. The diet dilemma is not unique to minorities and immigrants. America is a nation of snack-food-scarfing couch potatoes, leaving the question of why whites haven't been as impacted by type 2 diabetes as minorities. Research by Fujimoto and others suggests there are genetic differences among ethnic and racial groups related to where fat is stored in the body that may raise the diabetes risk. Fujimoto said there is a strong association between increased visceral adiposity — fat stored in the abdomen — and insulin resistance that can lead to diabetes. "Where you put your fat is important," he said. "It's the old apple vs. the pear body shape. We see more 'apples' in type 2 diabetes." But even within the "apple" barrel, the risk varies, he said. "You can have two people with an apple shape, one with most of the fat under the skin and the other with most of the fat inside the abdomen, and the one with the fat inside the abdomen is at greater risk for diabetes," Fujimoto said. Other research has found that Asians, Native Hawaiians, Pacific Islanders, Hispanics, African-Americans and some other minorities have a greater tendency to store fat in their bellies, boosting risk. In a study of Japanese-American men in Seattle, Fujimoto discovered his subjects were least able to carry excess weight before developing diabetes and other health impacts. "They don't have to gain a lot of weight. Their BMI (body mass index) doesn't have to be as high as for Caucasians," he said. The BMI is a measure of body fat based on height and weight. BMI of 25 to 29 is considered overweight, and 30 and above is obese. The World Health Organization recently suggested a lower BMI standard for Asians, 23 to 24 for overweight and 25 and above for obese. For Native Hawaiians and Pacific Islanders, the cutoff is higher — 26 to 31 BMI for overweight and 32 and up for obese. Another theory links the higher prevalence of diabetes in nonwhite immigrant populations to the so-called "thrifty gene," a genotype that allows the body to quickly store fat in times of abundance to survive periods of famine. Although helpful to hunter-gatherers, that would be a distinct disadvantage in a time of corner convenience stores and 24-hour drive-throughs. Others hypothesize that over the centuries, European whites adapted to foods that promote diabetes, while Asians and other groups around the globe now experiencing the diabetes onslaught have had only recent broader exposure. Kumu hula Panoke, for one, has shown that Native Hawaiians and others at greater risk of diabetes needn't be resigned to their genetic fate. "You can live a long life if you just take control of your diabetes and the amount of food and what you put into your body," he said. "I'm not saying you have to be perfect. It's portion control: Satisfy your craving and move on. And most important, get out of bed." Staff writer Dan Nakaso contributed to this report. Reach Christie Wilson at cwilson@honoluluadver tiser.com or 808-244-4880. Update: 3:58PM The rising food prices may actually bring some benefits for people living in the Pacific Islands, says a Pacific scientist. Dr Mary Taylor of the Secretariat of the Pacific Community believes the rising food prices will encourage people to grow their own food, reports Pacnews. Dr Taylor promotes crop diversity for the regional Institute, said the food crisis has a silver lining, which will encourage people to grow more of their own food and may change attitudes to traditional crops. "We have fewer options for feeding our people as 75 per cent of genetic diversity has been lost in the past century. Most people globally now rely on just 12 food crops and 14 animal species. "The rising cost of food is placing more value on the need to collect and share our plant materials. For example, an international plant centre in Hawaii has varieties of breadfruit trees that produce all year round," Dr Taylor said. According to her, traditional food crops often viewed as inferior to imported processed food were likely to become more popular. "No country is self sufficient in crop diversity and access to overseas stocks is vital. For example, in Samoa a taro disease in the 1990s wiped out the entire industry, and taro only recovered when more resistant varieties were imported," Dr Taylor said. She suggested that one way to prepare for future changes was to join the 120 countries who had ratified the international treaty on plant genetic resources for food and agriculture this was making it easier for countries to collect and share plant materials under the treatys standard material transfer agreements. Local food production has to increase, Director of Land Resources Division, Secretariat of the Pacific Community, Aleki Sisifa, said yesterday. Mr Sisifa was opening a three-day meeting of Heads of Agriculture and Forestry Services (HOAFS) in the region at the Development Bank of Samoa. In his speech, he highlighted some of the crisis that all countries of the Pacific and the world are facing. “Maintaining and improving food security in the face of the current global food and fuel price crises is a significant challenge,” he said. Mr Sisifa said that the crisis brings home the fact that the significant challenges that Pacific Island Countries and Territories (PICTs) face, particularly smallness and isolation from the international markets and supply sources, render the Pacific community very susceptible to global economic downturns. He stated this Integrated Strategic Plan for 2009-2012 focus on three objectives: to improve food and nutritional security, integrated and sustainable agriculture and forestry resource management and development, and improved bio-security and increased trade in agriculture and forestry products. He said that the meeting of the Pacific Island Forum leaders in Niue two weeks ago, accorded a high priority to Food Security, Climate Change Adaptation, and Land Management and Conflict Minimisation, in the Pacific Plan. He said that these three high-level, cross cutting issues underpin the three objectives of this new draft LRD Integrated Plan. Twenty countries and territories are attending the HOAFS meeting. The last HOAFS meeting was held in 2006 at Nadi, Fiji. Yesterday Mr Sisifa said,“The genetic resources for food and agriculture we have depended on for generations have been eroded over the years, a situation that may be made worse by climate change. “We need to sign up to the International Treaty for Plant Genetic Resources for Food and Agriculture, so that we can access a wider pool of diversity, and be able to share genetic resources,” he said. “Having adequate and secure access to customary land for development as well as ensuring sustainable land use have become more urgent with the need for increased pace of economic growth,” Mr Sisifa said. Land reform is among the subjects for discussion. He said non-communicable diseases were afflicting Pacific people in epidemic proportions, making the links between the agriculture and forestry sectors and the human health sector, of great importance. The demand to provide alternative fuels was competing with food production, including competition for the land for production. The outcomes of the Heads of Agriculture meeting will go before a meeting next week of Pacific Ministers of Agriculture and Forestry. The Ministers, meeting on 8th and 9th September, will also consider an Intergrated Strategic Plan , 2009-2012, for the SPC’s Land Resources Division. A catalogue of the breadfruit germplasm collection at the National Tropical Botanical Garden is now online as a searchable database on the Breadfruit Institute webpages (http://www.ntbg.org/breadfruit/collection). Varieties come to life through stunning photographs (courtesy of Jim Wiseman, DigitalMedia Hawaii/Pacific) that interactively present the visual gestalt of each tree, so necessary for accurate identification. The database combines variety information acquired during field work in the islands of origin as well as descriptors, weights, and measurements of fruits, leaves, seeds, and male flowers, collected during a decade of research on the breadfruit trees at Kahanu Garden. Data and photographs are now available for close to 80 varieties. The entire collection of more than 100 varieties and three species will become available as photographs and data are completed. Varieties from the Cook Islands, Federated States of Micronesia, Fiji, Hawaii, Kiribati, Mariana Islands, Palau, Samoa, Seychelles, Solomon Islands, Tonga, and Vanuatu are currently represented in the database. The database search page allows the user to find varieties by searching on scientific name (species), variety name, geographic origin, distribution, fruit weight, shape, or skin texture, seed number, and find those that do well in coastal, sandy soils or atolls. There is also a search option for varieties that will be available for distribution. Other search options include 20 selected varieties, a Pacific map showing where varieties were collected, and a list of variety names and synonyms.